Ramblings of an Impatient Artist: A Berry Nice Birthday! Shew, I'm like totally worn out now. Don't forget to leave some love and make sure you check out all to gorgeous new images available thru Sassy Studio Designs - the 80's edition! This card and your coloring is WONDERFUL! Jodi, your card looks so yummy. As always, your coloring is perfect. I love the green plaid paper and scalloped edge. She's so fabulously adorable! Great colors together and gorgeous coloring! I could just eat her up! Jodi, this is SO berry beautiful!!! Loving the checked papers!! !Great job! My daughter had all of the strawberry dolls, house, etc. It brings back such fond memories. Jodi, I m so envious of your coloring, well, it just pops right off the page. So sweet! Oh, of course, who could forget Strawberry Shortcake! Adorable creation Jodi! The coloring & design are just PERFECT! The 80's was more my daughters era and this hop is bringing back many fond memories of her growing years. Gorgeous card! Love you coloring and the DP you used! Awww Jodi this is just soooo sweet. Georgeous card and beautiful coloring on this wonderful card. Gorgeous card Jodi, I love her hair. 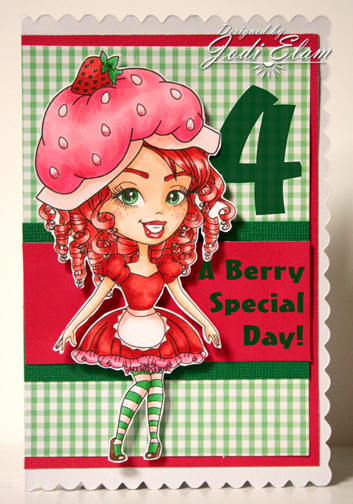 Very cute card, love your coloring, and love the gingham paper! Jodi, this is too cute! Perfect paper with this image...gorgeous coloring. Like................I love the gingham. Cute card. Super nice! Great design and coloring, TFS! Absolutely darling! Your coloring is always outstanding! Love this sweet creation, Jodi! Gosh I just LOVE LOVE LOVE your Card. Your Coloring never seizes to Amaze me. SO PRETTY!!!! 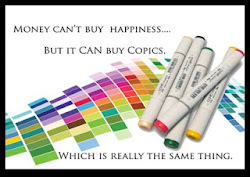 LOVE your colouring .... wow!!! Sooo sweet!!! 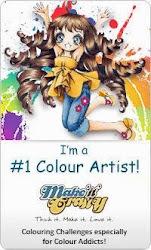 Love the image of honey and your colouring is awesome!!! Great layout!!! She is such a cutie patootie! Love the gorgeous coloring of her hair and her green eyes are just mesmerizing! Awesome, awesome card! Wow fantastic soooo cute nice and bright a very cheery card love the colours and your colouring is fab. 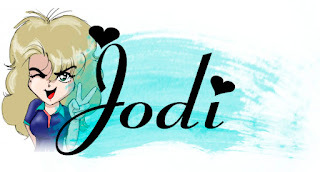 How adorable, Jodi. Your coloring is wonderful, and I love that green gingham paper. Perfect sentiment to go along with your super sweet creation. awww, she is soooo cute! love the paper you used with her! ohhh this is such a cute card!!! Totally love the DP you have used and the shape of the card. Totally love the colour scheme that you have used - very strawberry. What a wonderful image - I think this one would have to be my favourite. Totally Rad LOL.. This card is great you did a wonderful job coloring her! Oh, your card is so supersweet! Just love it!